I took my art pals Ed and Jenn on a mini Thrift Adventure this Saturday afternoon, stopping at a few of my favorite thrifts. 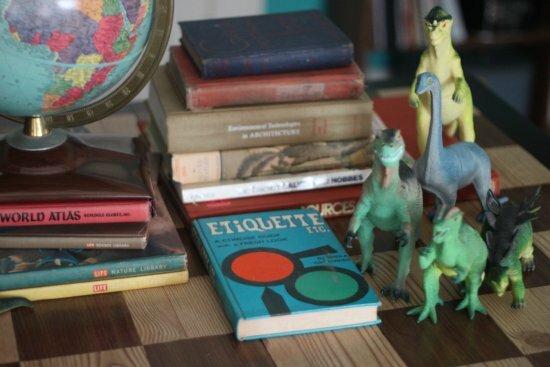 We found a lot of kitsch vintage goodies, practical things, and some books I can't wait to read. The vintage globe was one of my favorite finds from the weekend, I rarely encounter this in such clean and pristine condition. 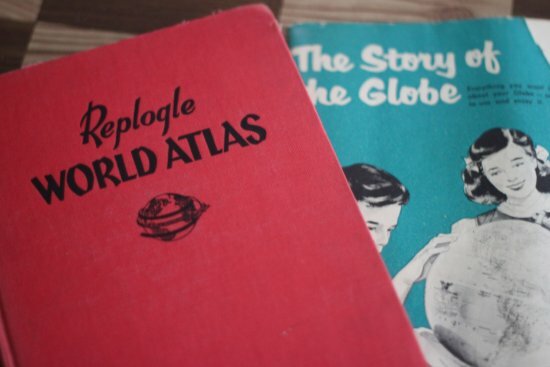 This one had a little shelf at the base the contained a vintage world atlas book and vintage pamphlet. Let me know if you're interested in this globe before I stick in the antique store booth. 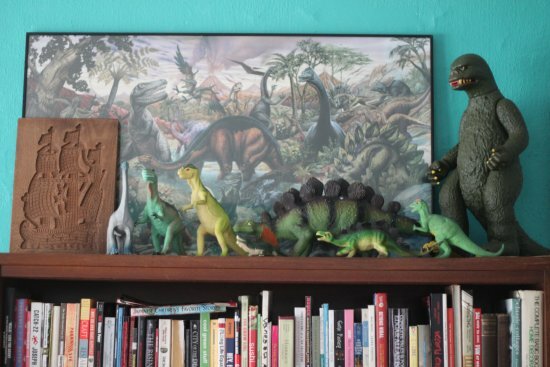 And as you can see, I scooped up a few more dinosaur pals to join the party in the dining room area. They go well with my dinosaur painting. I also found two glow in the dark dinosaurs that I promptly put in my bedroom. I liked this nifty little 1970s-looking set. I intend to clean it up and add it the antique store soon. I paid much more than I would have like for it, but it seemed too unique to leave behind. A happy find, I almost didn't do another walk around at a thrift store. 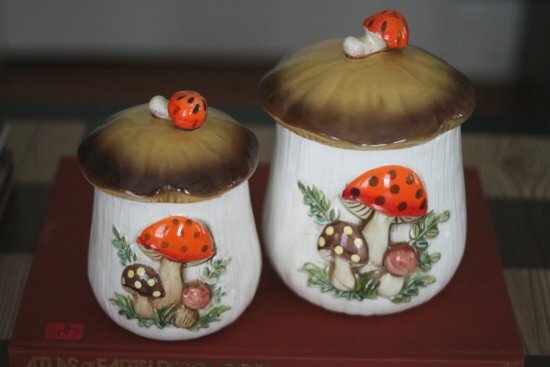 I would have missed these two merry mushroom jars if I didn't do that. These two match a large I've yet to sell. I might try to sell them as a set at the antique store and see how they do. These three are from an antique store I rarely go to. 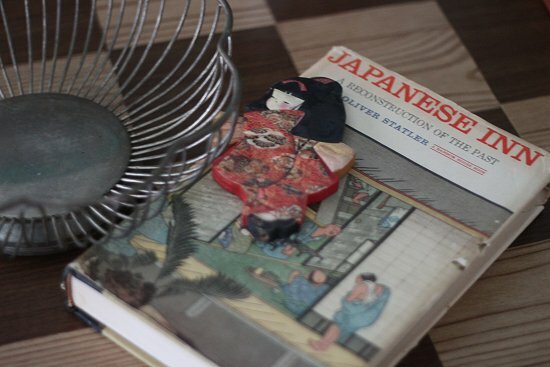 The little Japanese girl and book are fun, and I love the vintage metal basket. Nice shape and patina, these are perfect for art markets to hold little bits of merchandise. Holy Nuts! 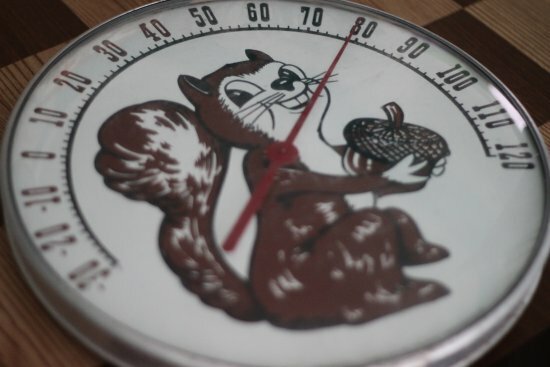 Cute Vintage Squirrel Thermostat! Another piece I paid more than I wanted for, but it was too fun to resist. To end this post with my obligatory rant: I want nearly everything at thrifts to be one dollar and under. I miss those days. Don't you? I have these exact mushroom canisters for sale in my shop, too! Yours are in better condition though. Great finds! I love them, but I hope they'll sell very soon! I'm selling a trio of them. 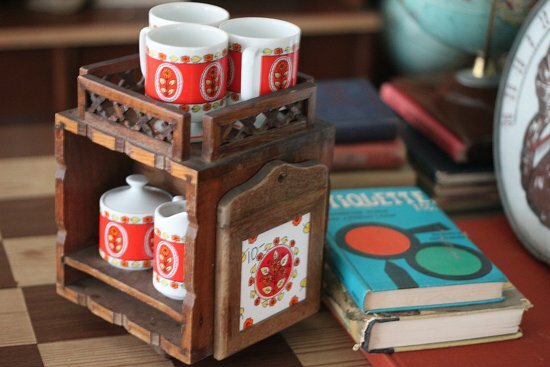 The cup set is a great find, I've never seen a set like that, very pretty! This weekend I found a 1920s black silk dress, great condition except for some shredding on the lining and a 1950s pink silk flower hat. I wish I had the same luck you do scooping up vintage clothes! I need to refine that skill! For a while all I was seeing were owls and now squirrels have made an apearance in the thrifts. Love the thermometer. Cara: Me too, I've never seen one with a cool vintage Atlas at the bottom! I'm trying to get it to the shop as soon as possible. i really like that 1970s cup thing, so unusual. i also wish that thrift stuff was super cheap - i found a couple of great shops in the Okanagan this month (see my blog on that) where things were super cheap - or they gave items to us because they were a little stained. but when that happens, i wonder how they raise any money for their charity. i'm always torn by the desire to get a deal and knowing that i'm really getting one anyway and wanting more means i rip off a good cause. sigh. cb: I need to make some from my Dino haul, I love the planters! I've cracked a merry mushroom jar before too, It's a wonder any survive. They are very fragile. Dogsmom: Ah ha, so it's probably a thermometer and not a thermostat, I had a feeling I'd get it wrong. I love that nutty squirrel, he looks like a Tex Avery cartoon character. Hi Van! 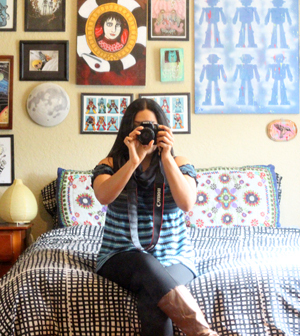 Sounds like your thrifting trip was a fun adventure! You scored some great finds too. I love that little cup/coffee/creamer/trivet? set - it's amazing. The colors are beautiful and I love how compact yet pretty the whole thing is. Another great globe find too! Oh such cute finds. Where I am at, rarely is anything under a $. Once in a while I find something, but prices seem to be on the rise even at thrift stores. 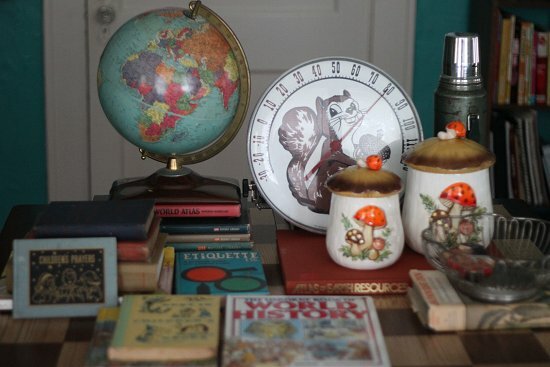 ooh, look at all the books and the cute little mushroom pots! i wish you'd taken me on this little thrift adventure too! ha! Great stuff! One of my friends found one of those squirrel thermometers years ago and I've been looking for one ever since. Lucky! The 70s set is very cute, worth the money I reckon.